Calling all SyFy execs: Archaeologists in the Arctic have found fossilized remains that could become the star of your next Saturday night movie. The scientists are even calling their discovery "Predator X." The creature, discovered in Svalbard, had a head twice the size of a Tyrannosarus Rex, and four times its bite force, according to scientists. 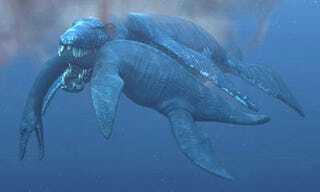 Estimates put the size of the marine predator at 45 tonnes and 15 feet, with each of its teeth measuring a foot in length. Its fossilized remains were discovered mid-last year, although full details about the creature - said to have lived almost 150 million years ago, and possibly an ancestor of the great white shark of today - won't be released until this summer. Not that that necessarily has to stop any cheaply-produced TV movies about it from being rushed into production. Not that I'm hinting or anything.